I am a touch typist and would like to know if there exists a way to type a question\answer with all the necessary formatting without the page automatically scrolling back up to where you input the code with each successive keystroke? There must be a way to dis-engage this annoying auto-scroll feature so that I can only see the rendered output as I type. This is the simplest way I can think to word this question; if it is unclear to anyone what I'm asking then please let me know and I will elaborate. Here is a userscript that I found in StackApps which was created partly by Antonio Vargas that enables side-by-side editing. 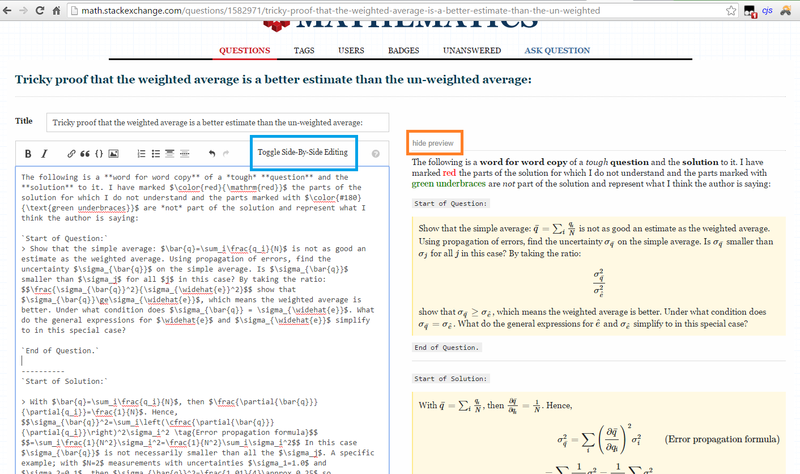 This userscript adds a button to the editor toolbar ('Toggle Side-By-Side Editing') shown in the blue box in the image below so you can view the preview and markdown side by side when asking or answering a question or when editing an existing question or answer. You can also hide the preview as shown in the orange box. To get this script first install Greasemonkey if you are using Firefox or Tampermonkey if using Chrome, and then click here. Not the answer you're looking for? Browse other questions tagged support feature-request markdown-preview editor user-scripts . When you are devoid of questioning and answering on this site.